Ever-changing employment law is a major feature of modern business life and failing to properly manage these vital issues can seriously damage your businesses finances and reputation. To help you stay informed and protected in every area of your employment activity, Bermans are part of the Praesidium Employment Law Protection network. Praesidium is a fixed-fee employment package for employers large and small, which provides guidance on all aspects of employment from recruitment to termination. The Praesidium package includes access to an extensive online document portal – Praesidium HR Online. This includes expert advice, policies & procedures, forms & letters and step-by-step guides, designed to assist HR professionals and business owners. Praesidium HR Online recently relaunched at the start of April 2019 following a redesign to create a more user friendly and modernised site. What does Praesidium HR Online allow you to do? Employment & HR advice – a first port of call to answer your everyday HR issues. Policies & procedures – Documents written in plain English to assist in the consistent management of employees. Forms & letters – A comprehensive suite of documents designed to simplify HR and personnel administration tasks, by providing templates for you to access. Step-by-step guides – Easy to follow guides for helping you manage all aspects of employment, including disciplinary, grievance and other employee meetings. 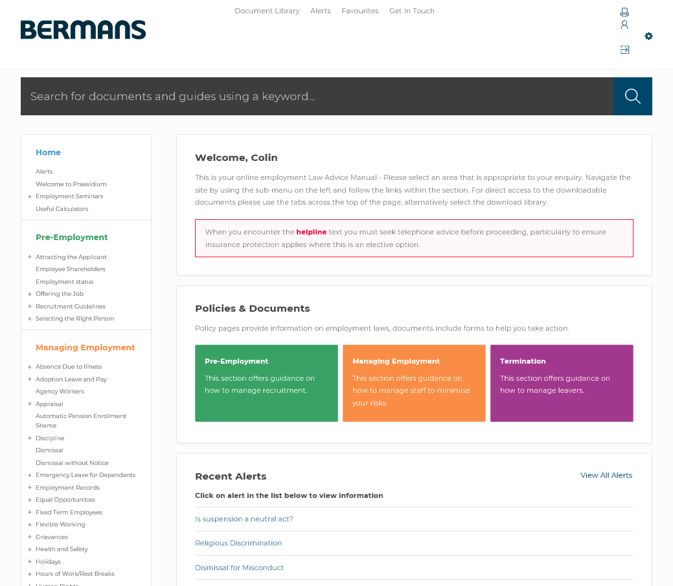 For £500p/a, you and your HR team can access Bermans Praesidium HR Online, which provides you with the tools to help you manage your HR function. Click here to visit the Praesidium website. Are you an accountant or HR consultant? Why not join Bermans Praesidium reseller network? This gives you the option to white label the website with your branding which you can share with your clients. Get in touch by calling 0151 224 0500 or email marketing@bermans.co.uk to find out more.